In the digital age we live in now, where informations are transparent with no distant limitation, however, informations pile over one another. New ways to extend brand and it’s products is key to a company’s success. How does an experiential branded physical pop up look like for a digital service company? Travel Pop Up is a physical experience of KAYAK’s unique online travel exploration tool. This project brings an online meta-search travel website, to local Pittsburgh. It exposes digital KAYAK service in a physical 360-degree immersive experience that emphasizes KAYAK’s values and it’s unique online destination exploration tool. The space and interactions emphasize KAYAK's values: desire, achievability, ownership, and autonomy. It creates a community to share and exchange desires. KAYAK APP tells you when is a great time to buy tickets, updates you on novel news about your desired destinations, and provides you education tools to enhance your future travel experience. Research teammate and I did research on KAYAK’s background, including it’s historical perspective, the service and market, competitors, existing audience, brand atitudes and behavior, company situation, brand essense and personality, and future opportunities, including it’s known, considerations, interactions, desired brand attitudes. Desires— Through exploration, they encourage desires and tell stories. Tools— Through transparent and objective comparison tools, they make desires achievable. Customization— Through complete customization, they provide customer ownership and autonomy. I was interested in creating both outdoor spaces for visitors to hang around and indoor spaces for visitors to interact with KAYAK’s services. Also, I wanted the exterior of the pop up to have mysterious quality, evoking visitors’ curiosity, while, have transparent quality, inviting visitors to walk in. 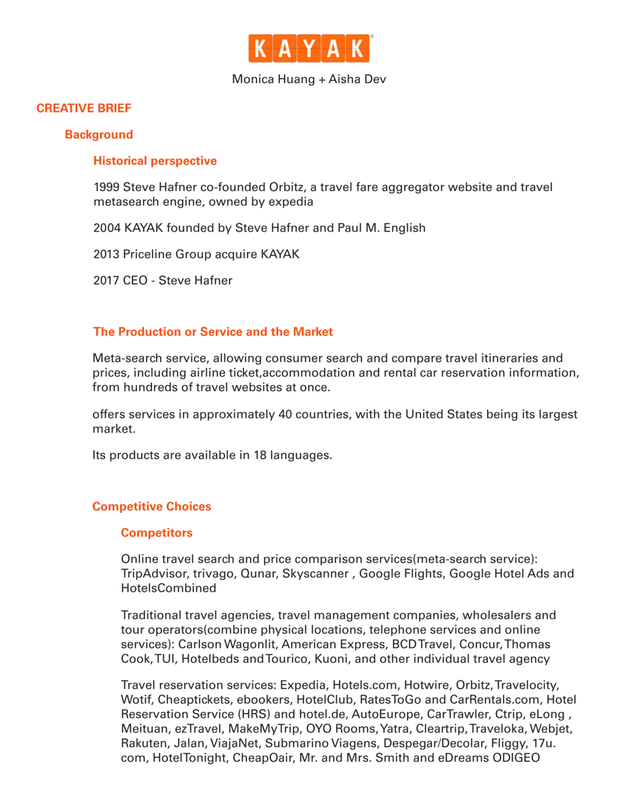 KAYAK is a travel meta search service website, allowing customer to search, compare and explore travel itineraries, including airline, train and cruise tickets, rental cars, and accommodation from hundreds of travel websites. I focused on KAYAK unique service: exploration tools. 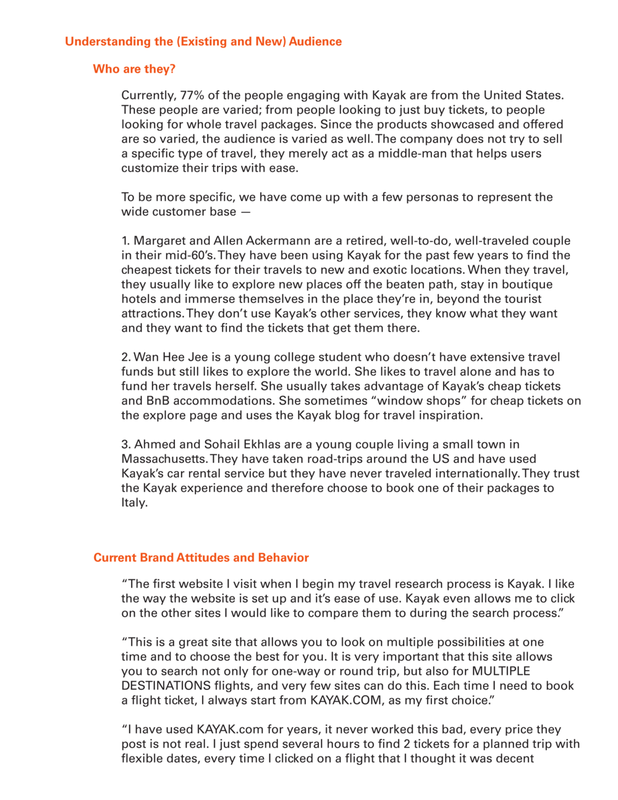 Through transparent and objective comparison tools, KAYAK suggests travel destinations based on customer prefered time, budget, temperature, activities, or countries. KAYAK encourages desires and makes desires achievable. Complete customization opportunity provides customer ownership and autonomy. Encouraging desires and tell stories through exploration, making desires achievable through transparent and objective, and providing customer ownership and autonomy through complete customization. In KAYAK TRAVEL 360 immersive experience has inviting, flexibility and flow qualities. The floor is an digital interactive world map. Entrance information panel is a solid two sided sheet that bend outward, creating an inviting entrance. Circular wall panels are angled slanted transparent sheets with projecting scenes on, metaphor KAYAK’s value in data transparency. The function of walls to be angled slanted is to adapt weather changes, collecting and navigating rain drops to one location. The top panel is an olive green concave tear drop shape that is made out of mirror. The olive green color on the top allow the form to fit in the park environment. The slight concave form creates open space for air to flow in and out. The mirror creates an immersive experience with reflected lights in the space. [The physical model is made with acrylic board, acrylic sheets, mirror sheets, and prints.